IHRC is demanding that the Nigerian authorities immediately release hundreds of people it has detained as they made their way to the capital, Abuja, to take part in a demonstration against the continued detention of Sheikh Ibrahim Zakzaky, his wife and over 200 IMN supporters, all held since December 2015. The call comes (see: press release) as tens of thousands of supporters of the sheikh took part in the procession in the capital today but countless others were stopped by armed forces at the entrance of the capital as they arrived in buses. While the exact number of those stopped and detained by the army in Abuja is unclear, it is believed to be in the hundreds. Latest reports from the Free Zakzaky Movement indicate that they are being held in military barracks in the city. Within 30 minutes of the procession starting, soldiers flanked by police fired tear gas grenades into the crowds, apparently to stop them proceeding to the Central Secretariat area where government buildings are located. When the tear gas failed to stop the procession continuing, the army started to physically stop people in the procession. It is believed that at this stage a number of people were arrested, though this is yet to be confirmed. There are reports of injuries but their extent and number is not yet known. Reports are still coming in about the extent and nature of the police and army action. 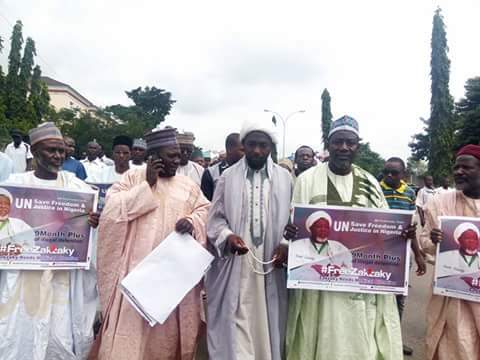 Today’s demonstration is the latest initiative in an ongoing campaign to secure the release of Sheikh Zakzaky as concerns mount over his health after more than nine months in custody without charge along with his wife Zeenah. IHRC continues to call for the immediate and unconditional release of Sheikh Zakzaky, his wife, and all those held since the 12 – 14 December attacks by the army on the IMN. Please email and encourage others to email the Nigerian embassy in your country and / or the Minister of Foreign Affairs in Nigeria (directory of embassies / high commissions here; address of Minister of Foreign Affairs here) demanding that the couple receive immediate medical assistance and that they are released immediately and unconditionally. For those in the USA, please email the Nigerian embassy using this form. Please send any responses to IHRC on info@ihrc.org. In particular I am deeply distressed to hear that hundreds have been detained as they were making their way to Abuja to take part in a demonstration on 22 September 2016 against the continued detention of Mu’allim Ibrahim el-Zakzaky, Mallima Zeenah and over 200 IMN supporters. Within 30 minutes of the procession starting, soldiers flanked by police fired tear gas grenades into the crowds, apparently to stop them proceeding to the Central Secretariat area where government buildings are located. When the tear gas failed to stop the procession continuing, the army started to physically stop people in the procession. This new round of detention and ill-treatment is a stain on the reputation of Nigeria that cannot easily be forgotten.